Compared to some of the lithe and elegant bulbs in this comparison, the enormous, heavyweight LIFX bulb looks positively primitive. This jumbo (and somewhat homely) bulb weighs in at over 3/4 of a pound, and is so large in size that I had to dismantle my lampshade to get it into the socket. The reason for LIFX’s extra girth is because it’s entirely self-contained. No ZigBee bridge here, LIFX is Wi-Fi all the way, with a radio embedded directly into the bulb. This makes the bulb bigger—and cost more—but in my analysis, it’s definitely worth it. Setup is very simple: Screw it in and turn it on, then install and launch the mobile app. The LIFX app connects you directly to the bulb’s temporary Wi-Fi network, which you then reassign to your home Wi-Fi network. The process is streamlined, well-debugged, and takes less than two minutes all told. Let’s move on to lighting aesthetics. Once you flip the power switch, the LIFX immediately shines (no pun intended). It’s a super-bright unit, putting out more than 1000 lumens at maximum brightness with colors that are rich and vibrant. The accompanying app is extremely intuitive and is quite a breeze to use. Just tap your bulb and you’re given a simple wheel of white light color temperatures to pick from, plus a dimmer slider in the center of the wheel. Dimming is both quite smooth and precise, and the app provides you with a numerical readout, taking you from 1- to 100 percent brightness in 1-percent increments. While white colors are the default, it’s easy to hop over to the full color wheel if you want to have some fun. Again, you get the now-familiar wheel to dial in just the right color, plus the same dimmer slider in the middle. Both wheels provide easy access to a power button, too. You want more? LIFX has it, thanks to an effects panel that lets you set the bulb to cycle through colors (a feature that really should be de rigueur for every color-tunable bulb on the market), a candle flicker mode, and a music visualizer that lets the bulb change color and brightness in time with music that’s detected by your device’s microphone. If all that’s not enough party for you, there’s also a strobe light. A scheduling system is also included (this feature requires a LIFX account to use). Lifx provides a bulb that has both fantastic utility and lots of fun features, making it ideal for almost any environment (provided your light fixture is big enough to handle it). The Wi-Fi-only delivers superior range to give you far more flexibility in where you place the bulbs, and the company says only one bulb must be in range of your router (but each bulb must be within range of at least one other). All told, it’s the brightest bulb in more ways than one. 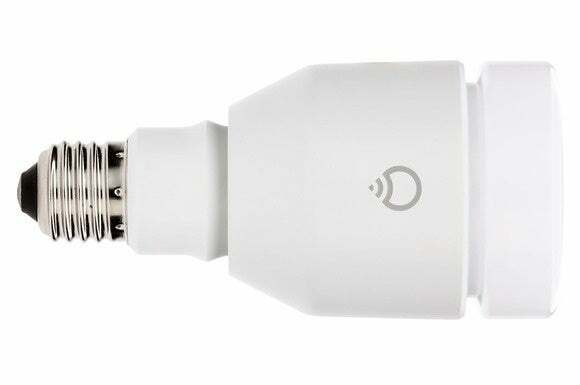 Aside from its significant size, there’s virtually nothing to dislike about this spot-on bulb and its stellar mobile companion app.